Lineage. Constituted 27th Aerospace Medicine Squadron on 26 Aug 1994. Activated on 1 Sep 1994. Redesignated: 27th Aeromedical-Dental Squadron on 1 Sep 1997; 27th Special Operations Aerospace Medicine Squadron on 1 Oct 2007-. Assignments. 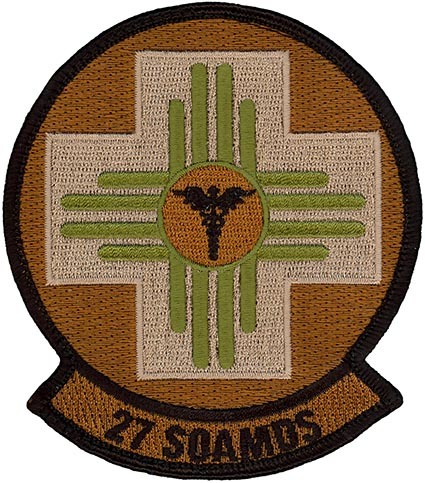 27th Medical Group, 1 Sep 1994; 27th Special Operations Medical Group, 1 Oct 2007-. Stations. Cannon AFB, NM, 1 Sep 1994-. Operations. Provides global special operations taskings as an Air Force component member of U.S. Special Operations Command. Promotes and maintains the health of all active duty, Air National Guard and Air Force Reserve, civilian personnel, dependants and retirees in the local area. Ensure maximum wartime readiness via aircrew healthcare, disease prevention, wellness promotion, medical readiness, workspace/environmental surveillance, and dental care. Honors. Air Force Outstanding Unit Award: 1 Jun 1996-31 May 1998; 1 Jun 2002-31 May 2004.